The title of this LEGO Bag set has been translated from German. Therefore, the title may not be entirely accurate. 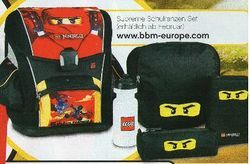 Ninjago Supreme Satchel Set is a Ninjago bag set released in February 2011. Facts about "Ninjago Supreme Satchel Set"
This page was last edited on 9 January 2016, at 23:08.